Smoke and Rye take you on a tour throughout the USA with food, drink and musical favourites from state to state in their postmodern Saloon Bar and American Restaurant based in Stone, Staffordshire. You can enjoy the finest quality produce, prepared on site by their experienced chefs, complemented by imported craft beer and a high quality, specially selected wine list. 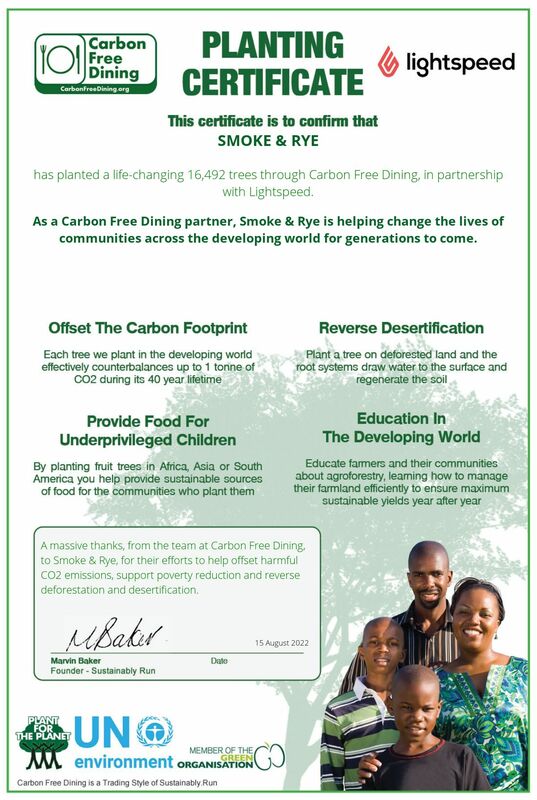 Smoke and Rye has teamed up with Carbon Free Dining, the United Nations-backed Restaurant initiative. They have chosen to demonstrate their love for the environment by partnering with the programme. As a Carbon Free Dining Certified restaurant, Smoke and Rye plants hundreds of trees each month, effectively counterbalancing the Carbon Footprint of the meals they serve. This is done by simply giving diners the opportunity of planting a single fruit tree with each bill for an optional 99p. Carbon Free Dining Certified Restaurant? How would you rate Carbon Free Dining?